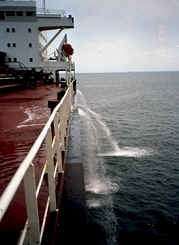 A cargo ship discharging ballast water into the sea. The environmental impact of shipping includes greenhouse gas emissions, acoustic, and oil pollution. The International Maritime Organization (IMO) estimates that Carbon dioxide emissions from shipping were equal to 2.2% of the global human-made emissions in 2012 and expects them to rise by as much as 2 to 3 times by 2050 if no action is taken. The Convention on the Conservation of Migratory Species has identified ocean noise as a potential threat to marine life. The disruption of whales' ability to communicate with one another is an extreme threat and is affecting their ability to survive. According to Discovery Channel's article on Sonic Sea Journeys Deep Into the Ocean, over the last century, extremely loud noise from commercial ships, oil and gas exploration, naval sonar exercises and other sources has transformed the ocean’s delicate acoustic habitat, challenging the ability of whales and other marine life to prosper and ultimately to survive. Whales are starting to react to this in ways that are life-threatening. Kenneth C. Balcomb, a whale researcher and a former U.S Navy officer, states that the day March 15, 2000, is the day of infamy. As Discovery says, where him and his crew discovered whales swimming dangerously close to the shore. They’re supposed to be in deep water. So I pushed it back out to sea, says Balcomb. Although sonar helps to protect us, it is destroying marine life. According to IFAW Animal Rescue Program Director Katie Moore, There’s different ways that sounds can affect animals. There’s that underlying ambient noise level that’s rising, and rising, and rising that interferes with communication and their movement patterns. And then there’s the more acute kind of traumatic impact of sound, that’s causing physical damage or a really strong behavioral response. It’s fight or flight. Marine mammals, such as whales and manatees, risk being struck by ships, causing injury and death. For example, if a ship is traveling at a speed of only 15 knots, there is a 79 percent chance of a collision being lethal to a whale. Air pollution from cruise ships is generated by diesel engines that burn high sulfur content fuel oil, also known as bunker oil, producing sulfur dioxide, nitrogen oxide and particulate, in addition to carbon monoxide, carbon dioxide, and hydrocarbons. Diesel exhaust has been classified by EPA as a likely human carcinogen. EPA recognizes that these emissions from marine diesel engines contribute to ozone and carbon monoxide non-attainment (i.e., failure to meet air quality standards), as well as adverse health effects associated with ambient concentrations of particulate matter and visibility, haze, acid deposition, and eutrophication and nitrification of water. EPA estimates that large marine diesel engines accounted for about 1.6 percent of mobile source nitrogen oxide emissions and 2.8 percent of mobile source particulate emissions in the United States in 2000. Contributions of marine diesel engines can be higher on a port-specific basis. Ultra-low sulfur diesel (ULSD) is a standard for defining diesel fuel with substantially lowered sulfur contents. As of 2006, almost all of the petroleum-based diesel fuel available in Europe and North America is of a ULSD type. Of total global air emissions, shipping accounts for 18 to 30 percent of the nitrogen oxide and 9 percent of the sulphur oxides. Sulfur in the air creates acid rain which damages crops and buildings. When inhaled, sulfur is known to cause respiratory problems and even increases the risk of a heart attack. According to Irene Blooming, a spokeswoman for the European environmental coalition Seas at Risk, the fuel used in oil tankers and container ships is high in sulfur and cheaper to buy compared to the fuel used for domestic land use. "A ship lets out around 50 times more sulfur than a lorry per metric tonne of cargo carried." Cities in the U.S. like Long Beach, Los Angeles, Houston, Galveston, and Pittsburgh see some of the heaviest shipping traffic in the nation and have left local officials desperately trying to clean up the air. Increasing trade between the U.S. and China is helping to increase the number of vessels navigating the Pacific and exacerbating many of the environmental problems. To maintain the level of growth China is experiencing, large amounts of grain are being shipped to China by the boat load. The number of voyages are expected to continue increasing. 3.5 to 4 percent of all climate change emissions are caused by shipping, primarily carbon dioxide. One source of environmental stresses on maritime vessels recently has come from states and localities, as they assess the contribution of commercial marine vessels to regional air quality problems when ships are docked at port. For instance, large marine diesel engines are believed to contribute 7 percent of mobile source nitrogen oxide emissions in Baton Rouge/New Orleans. Ships can also have a significant impact in areas without large commercial ports: they contribute about 37 percent of total area nitrogen oxide emissions in the Santa Barbara area, and that percentage is expected to increase to 61 percent by 2015. Again, there is little cruise-industry specific data on this issue. They comprise only a small fraction of the world shipping fleet, but cruise ship emissions may exert significant impacts on a local scale in specific coastal areas that are visited repeatedly. Shipboard incinerators also burn large volumes of garbage, plastics, and other waste, producing ash that must be disposed of. Incinerators may release toxic emissions as well. Some of the major international efforts in the form of treaties are the Marine Pollution Treaty, Honolulu, which deals with regulating marine pollution from ships, and the UN Convention on Law of the Sea, which deals with marine species and pollution. While plenty of local and international regulations have been introduced throughout maritime history, much of the current regulations are considered inadequate. "In general, the treaties tend to emphasize the technical features of safety and pollution control measures without going to the root causes of sub-standard shipping, the absence of incentives for compliance and the lack of enforceability of measures." The most common problems encountered with international shipping arise from paperwork errors and customs brokers not having the proper information about your items. Cruise ships, for example, are exempt from regulation under the US discharge permit system (NPDES, under the Clean Water Act) that requires compliance with technology-based standards. In the Caribbean, many ports lack proper waste disposal facilities, and many ships dump their waste at sea. Solid waste generated on a ship includes glass, paper, cardboard, aluminium and steel cans, and plastics. It can be either non-hazardous or hazardous in nature. Solid waste that enters the ocean may become marine debris, and can then pose a threat to marine organisms, humans, coastal communities, and industries that utilize marine waters. Cruise ships typically manage solid waste by a combination of source reduction, waste minimization, and recycling. However, as much as 75 percent of solid waste is incinerated on board, and the ash typically is discharged at sea, although some is landed ashore for disposal or recycling. Marine mammals, fish, sea turtles, and birds can be injured or killed from entanglement with plastics and other solid waste that may be released or disposed off of cruise ships. On average, each cruise ship passenger generates at least two pounds of non-hazardous solid waste per day. With large cruise ships carrying several thousand passengers, the amount of waste generated in a day can be massive. For a large cruise ship, about 8 tons of solid waste are generated during a one-week cruise. It has been estimated that 24 percent of the solid waste generated by vessels worldwide (by weight) comes from cruise ships. Most cruise ship garbage is treated on board (incinerated, pulped, or ground up) for discharge overboard. When garbage must be off-loaded (for example, because glass and aluminium cannot be incinerated), cruise ships can put a strain on port reception facilities, which are rarely adequate to the task of serving a large passenger vessel. EC-IMO Energy Efficiency Project. The 4-year project aims to establish Maritime Technology Cooperation Centres in 5 regions: Africa, Asia, the Caribbean, Latin America and the Pacific. Through technical assistance and capacity-building, the centres will promote the uptake of low carbon technologies and operations in maritime transport in the less developed countries in the respective region. This will also support the implementation of the internationally agreed energy efficiency rules and standards (EEDI and SEEMP). It is expected that, (from 2004) "...shipping traffic to and from the United States is projected to double by 2020." ↑ International Maritime Organization, London (2008). "Working Group Oslo June 2008." ↑ SustainableShipping.com (2008). "IMO targets greenhouse gas emissions." (London: Petromedia Group). 2008-06-17. ↑ "Noise could sound the death knell of ocean fish". The Hindu. London. 15 August 2010. Retrieved 2011-03-06. ↑ Simpson, Stephen D.; Mark G. Meekan; Nicholas J. Larsen; Robert D. McCauley; Andrew Jeffs (2010). "Behavioral plasticity in larval reef fish: orientation is influenced by recent acoustic experiences". Behavioral Ecology. 21 (5): 1098–1105. doi:10.1093/beheco/arq117. 1 2 Vanderlaan & Taggart (2007). "Vessel collisions with whales: the probability of lethal injury based on vessel speed" (PDF). Mar Mam. Sci. Retrieved 2008-05-10. ↑ Ward-Geiger, L.I. ; Silber, G.K.; Baumstark, R.D. ; Pulfer, T.L. (3 March 2005). "Characterization of Ship Traffic in Right Whale Critical Habitat" (PDF). Coastal Management. Taylor & Francis Inc. 33: 263–278. doi:10.1080/08920750590951965. ISSN 0892-0753. Retrieved 22 August 2009. ↑ Reilly, S.B. ; Bannister, J.L. ; Best, P.B. ; Brown, M.; Brownell Jr., R.L. ; Butterworth, D.S. ; Clapham, P.J. ; Cooke, J.; Donovan, G.P. ; Urbán, J.; et al. (2008). "Eubalaena glacialis". IUCN Red List of Threatened Species. Version 2009.1. International Union for Conservation of Nature. Retrieved 22 August 2009. ↑ "Shipping threat to endangered whale". BBC News Online. BBC. 28 August 2001. 1 2 3 4 Shipping contributes up to 3 percent of worldwide CO2 emissions, says study, Voice of Russia UK. 27 June 2014. ↑ High Seas, High Stakes, Final Report. Tyndall Centre for Climate Change Research, Univ. of Manchester, UK. 2014. 1 2 US Environmental Protection Agency (EPA), Washington, DC. "Control of Emissions From New Marine Compression-Ignition Engines at or Above 30 Liters Per Cylinder." Final rule. Federal Register, 68 FR 9751, 2003-02-28. ↑ Schrooten, L; De Vlieger, Ina; Int Panis, Luc; Chiffi, Cosimo; Pastori, Enrico (2009). "Emissions of maritime transport: a reference system". 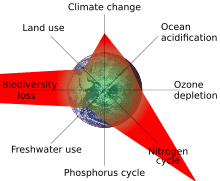 Science of the Total Environment. 408: 318–323. doi:10.1016/j.scitotenv.2009.07.03710.1186/1476-069X-9-64. 1 2 Vidal, John (2009-04-09). "Health risks of shipping pollution have been 'underestimated'". The Guardian. Retrieved 2009-07-03. ↑ Schrooten, L; De Vlieger, Ina; Int Panis, Luc; Styns, R. Torfs, K; Torfs, R (2008). "Inventory and forecasting of maritime emissions in the Belgian sea territory, an activity based emission model". Atmospheric Environment. 42 (4): 667–676. doi:10.1016/j.atmosenv.2007.09.071. 1 2 3 Panetta, L. E. (Chair) (2003). "America's living oceans: charting a course for sea change." Electronic Version, CD. Pew Oceans Commission. ↑ Steger, M. B. (2003). Globalization: A Very Short Introduction. Oxford University Press Inc. New York. ↑ EPA Draft Discharge Assessment Report, pp. 3-5 - 3-6. ↑ Cruise Control, p. 15. ↑ The Center for Environmental Leadership in Business, "A Shifting Tide, Environmental Challenges and Cruise Industry Responses," p. 14. ↑ Bluewater Network, "Cruising for Trouble: Stemming the Tide of Cruise Ship Pollution," March 2000, p. 5. A report prepared for an industry group estimated that a 3,000-person cruise ship generates 1.1 million US gallons (4,200 m3) of graywater during a seven-day cruise. Don K. Kim, "Cruise Ship Waste Dispersion Analysis Report on the Analysis of Graywater Discharge," presented to the International Council of Cruise Lines, 14 September 2000. ↑ National Research Council, Committee on Shipboard Wastes, Clean Ships, Clean Ports, Clean Oceans: Controlling Garbage and Plastic Wastes at Sea (National Academy Press, 1995), Table 2-3, pp. 38-39. ↑ National Research Council, Committee on Shipboard Wastes, Clean Ships, Clean Ports, Clean Oceans: Controlling Garbage and Plastic Wastes at Sea (National Academy Press, 1995), p. 126. ↑ "Shifting Tide," p. 16. ↑ Adams, Marilyn (2002-11-07). "Cruise ship pollution fine draws criticism". USA Today. ↑ Huettel, Steve (2004-04-14). "Liner may have dumped oily water, reports say". St. Petersburg Times. Copeland, Claudia (2008). "Cruise Ship Pollution: Background, Laws and Regulations, and Key Issues." CRS Report for Congress. Order Code RL32450. Washington, DC: Congressional Research Service. Updated 2008-02-06.